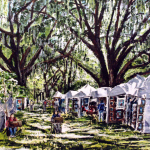 Tallahassee’s nationally acclaimed Chain of Parks Art Festival happens this weekend, April 21 and 22. This is the 18th year for the art show and sale, which has kept growing in size and reputation since its inception. Festival attendees stroll through 170 booths containing every possible expression of visual art. One thing that will be different about this year’s Chain of Parks Festival is that LeMoyne Board Member Kelly Dozier will not be the event’s director. That ‘someone’ taking over as festival director is Vanessa Rowse. She said last year’s designation of the event by Sunshine Artist Magazine as the number one art and design show in the nation continues to give Chain of Parks a massive boost. Rowse added the number of participating artists in the festival has grown to essentially fill downtown Tallahassee’s Chain of Parks. Dozier, who now holds the title of event chair, remarked that it’s critical to strike a good balance of out-of-town and local talent, as well as old and new exhibitors. Speaking of local artists and supporters of the arts, Dozier said a recent addition to the Chain of Parks Festival was naming the various lanes or paths through the exhibits in honor of people who have helped make it all happen. That lane-naming tradition, she says, continues this year. The Festival has long had a musical component. Various local players typically provide entertainment during the day. But last year, organizers added a nighttime performance by a musical headliner. Director Vanessa Rowse said that will continue this year. The LeMoyne Center’s online pages: www.chainofparks.org has a full rundown about the Chain of Parks Festival coming up this weekend. Rated the number one community art festival in the nation by a prominent arts magazine, Tallahassee’s upcoming Chain of Parks Festival will have a new look and a regional music headliner this year. 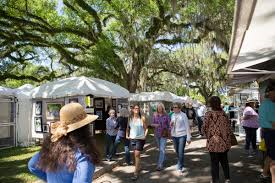 Local officials are gloating after a prominent trade journal named Tallahassee’s annual LeMoyne Art Festival the best in the nation.